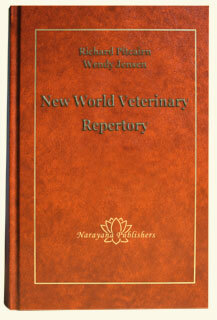 The very first repertory designed exclusively for veterinary use. Of the more than 110 repertories published over the last two centuries*, this is the first that has been carefully constructed to be of special application to veterinary practice. Until now, veterinarians practicing the homeopathy of Hahnemann have used the repertories designed for human beings – Kent's, Boenninghausen's Therapeutic Pocketbook, Boger edition of Boenninghausen's repertory, The Synthetic Repertory, etc. These are excellent repertories for human use but can be a challenge to veterinarians for two reasons. 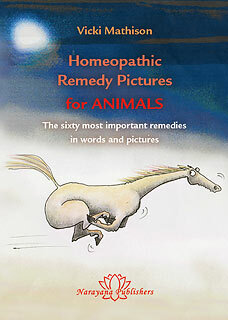 Veterinarians Richard Pitcairn and Wendy Jensen, together with over 55 years' experience in exclusively homeopathic practices, bring their knowledge of animal conditions and the correspondingly most applicable rubrics to this unparalleled reference work. The Boenninghausen repertory, edited by Boger, was the foundation for the work because of its emphasis on physical conditions and its skillful use of modalities and concomitants that are so necessary in veterinary work. After editing out the non-applicable material, rubrics especially helpful in animal cases were added or enlarged – primarily from Kent's repertory, but also from other sources including Jahr, Boger, Allen, Hering and Boericke. Extensive cross references were also added to make the discovery of the most similar rubric much easier than ever before. 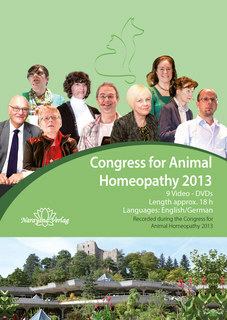 Keenly awaited and a major success – over 250 veterinary homeopaths from 12 countries met in April 2013 for the second international congress of animal homeopathy, which featured a series of varied and highly practical contributions that were enthusiastically received by the participants. Tim Couzens: finding the remedy for horses and a description of helpful remedies for the most important illnesses, plus lively portraits of numerous remedy pictures in horses. Christiane Krüger: portraits of horses remedy types, illustrated with expressive cases and clinical indications. Gertrud Pysall: observations on communication with horses using brief, incisive video clips. Sue Armstrong: procedures in homeopathic cancer treatment from prevention to palliative care in the final stages, plus observations on the connection between cancer and injury or inflammation. Dominique Fraefel: descriptions and video clips showing the behaviour and physical symptoms of Lycopodium cats. Gilberte Favre: the nature of sheep and how to interact with them – supplemented with practical tips on the investigation and prescription of homeopathic remedies, plus the depiction of key constitutional and first-aid remedies. Rosina Sonnenschmidt: holistic treatment of birds consisting of hormonal therapy, light therapy, bird acupuncture (as developed by her), and miasmatic homeopathy with numerous examples. Anke Henne: usage and applications of leeches – for example, in treatment of the musculoskeletal system. The emphasis on practical applications and the breadth of the topics provided everyone – whether treating large animals or small ones – with a wealth of useful information, making this animal homeopathy congress a valuable source of inspiration for the treatment of animals. This illustrated book of 700 pages covers the complete materia medica of the 20 Lacs which have published provings. The material is set out synoptically in a mind-map presentation with rubrics in Generalities; Mind and Dreams grouped thematically for ease of understanding of the main concepts. The text is interspersed with personal commentary from Patricia's experience both as a homoeopath as well as a lactation consultant, and this serves to embellish certain aspects of the material from a Doctrine of Signatures perspective as well as flag differential markers. Each materia medica chapter has a comprehensive bibliography as well as a list of remedies to be considered in differential diagnosis. Additionally, a comprehensive repertory of all the rubrics from both published provings as well as cases, serves to make this THE book you will reach for when a Lac is being considered.